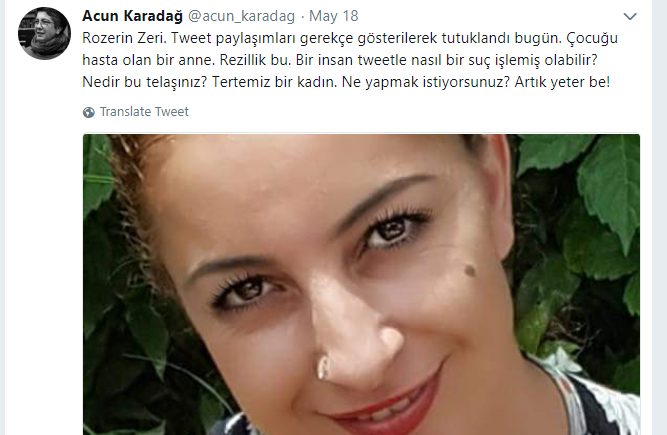 According to a tweet posted by Acun Karadağ, a history teacher who was fired from his job with a government decree issued by the Turkish government in the aftermath of a coup attempt on July 15, 2016, Zeri was sent to prison late on Saturday because of her facebook posts that are in critical of the Turkish government. “Rozerin Zeri. She was arrested today due to her social media posts. She is a mother of a sick kid. What kind of crime she could commit with a single tweet? She is innocent. What’s with the haste of yours? What are you trying to do? Enough is enough!” Karadağ tweeted.